As artist David Hockney recovered from a minor stroke, he decided to paint portraits of his friends. The result is "82 Portraits and 1 Still-life," an exhibit now on view at The Los Angeles County Museum of Art. Rufus Hale was 11 years old when Hockney painted his portrait. It's a "basically identical" likeness, Hale says. Exhibit curator Stephanie Barron says "the rest of the world just fades away" when you sit for Hockney. In early March 2014, a friend of Hockney's had to cancel because her father was ill. Hockney's paints were already set up though, so he painted this still life instead. Rufus was dressed nicely that day — in a long-sleeve white shirt, nice pants, good shoes and a red tie. He fidgeted during their three-hour session, but Hockney didn't mind. Rufus says the artist created a pretty good likeness except ... "he gave me blue eyes for some reason," says brown-eyed Rufus. "Aside from that it was basically identical to me. It's weird." Perhaps blue-eyed David Hockney saw himself in the boy — a young, blond Brit, sitting there with his sketchbook, just as young David would have done. The people captured on these three-foot, square-ish canvases are a "snapshot of David's life," explains curator Stephanie Barron, whose portrait also appears in the exhibit. "There's a democracy," she explains, to the way Hockney posed his subjects. "You can have an eminent museum director or an architect, or an actor next to the fellow who comes to wash his cars, or some of the women who help run his household," Barron says. 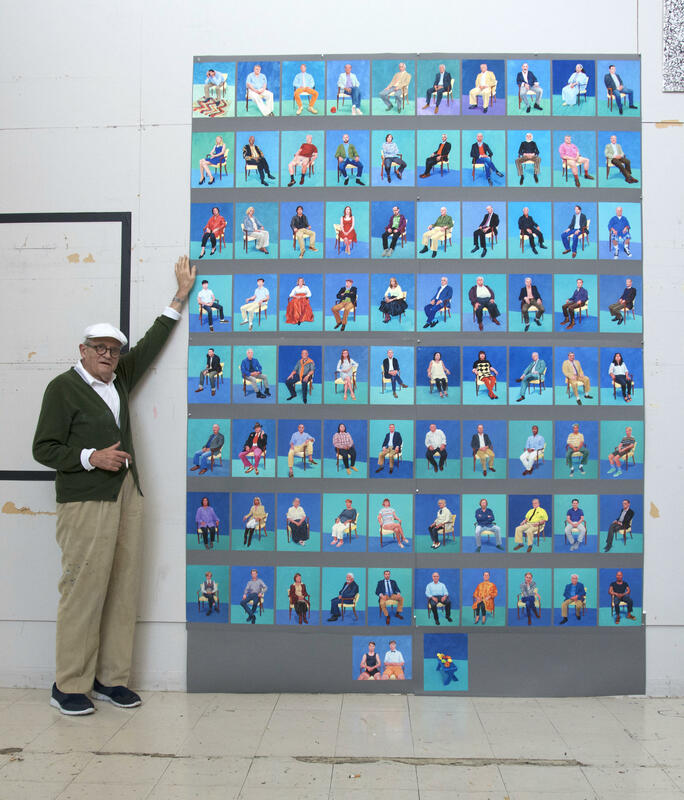 They all sit in the same yellow armchair, against the same blue or green background — Hockney's choice — on the same blue or green floor. On that floor, an assistant would draw lines around their feet, so they could reposition properly after breaks. Then Hockney would charcoal a rough sketch on the blank canvas. "There is nothing except the canvas, the artist, his gaze, and you," Barron says. "That's it. The rest of the world just fades away." "He stands very erect," recalls Dagny Corcoran, Hockney's friend and artbook seller. "He puts one hand behind his back ... holds his arm out with a long brush, and it's like, whoa, that's amazing — that's what painters look like!" For three hours Hockey would look, and look, and paint and look. They'd break for lunch (excellent food, Rufus says), and then work another few hours in the afternoon. "David has an uncanny way of capturing someone quite quickly," says Douglas Roberts, an art dealer and longtime friend of the artist. The first day, Hockney starts with the head and moves onto the body. The second day, he goes back to the head, and works on the hands. And on day three he finishes up. "It's completely silent in the studio," Roberts says. "He works absolutely quietly. And he's a bit deaf ... he's got hearing aids to assist. There was always music in the studio — opera playing or something, but now, not at all." Just silence, sitting and scrutiny. Stephanie Barron thought she'd go to work on the days after she posed for Hockney. "What I found instead is that I was so exhausted from the intensity of the scrutiny — I went home and took a nap," she says. But Hockney kept going. In a way, he had to. "He had had a minor stroke," Roberts explains. "Which sort of slapped him in the face a bit, I think, and the best therapy was to begin painting right away." So he decided to paint friends — people it would be easy for him to be with. Roberts believes "he just needed the company to sort of get through." The LACMA exhibit displays the portraits in chronological order, and Roberts sees his friend's health improving from canvas to canvas. "He says when he stands at the easel and paints he feels 30 years old," Roberts says. That renewed health and energy, resulted in 82 vivid, colorful portraits — and one still life. Why the still life? The friend who had been scheduled to sit that day had to cancel — her father was very ill. But the materials were already set up, so Hockney made a vibrant painting of bananas, red pepper, lemons, oranges arranged on a bright blue wooden bench. Visiting these works at LACMA is like attending a lively party with David Hockney and his friends. The invitation lasts through the end of July. Danny Hajek, Andrew Limbong and Shannon Rhoades produced and edited this story for broadcast. Beth Novey adapted it for the Web. 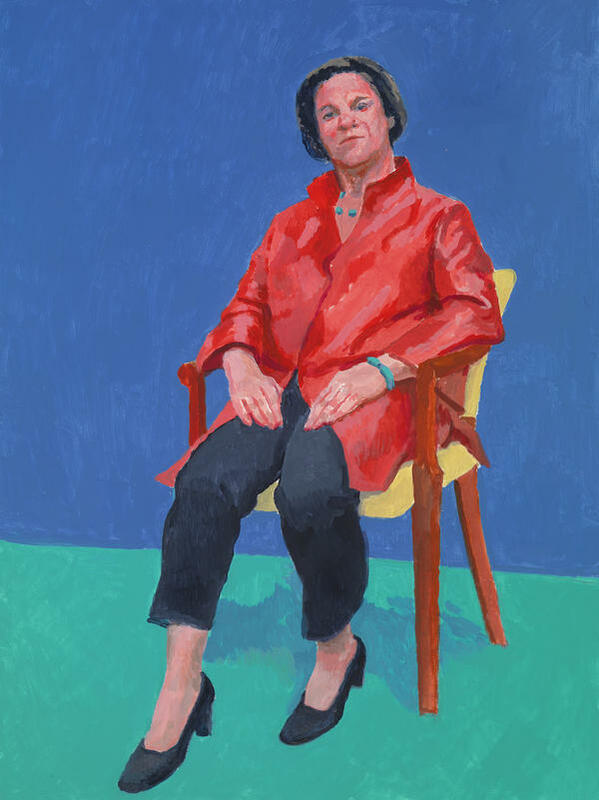 At the age of 80, the artist David Hockney has put on a show in Los Angeles called "82 Portraits And 1 Still-life," which got NPR's Susan Stamberg thinking about the people who posed for him. 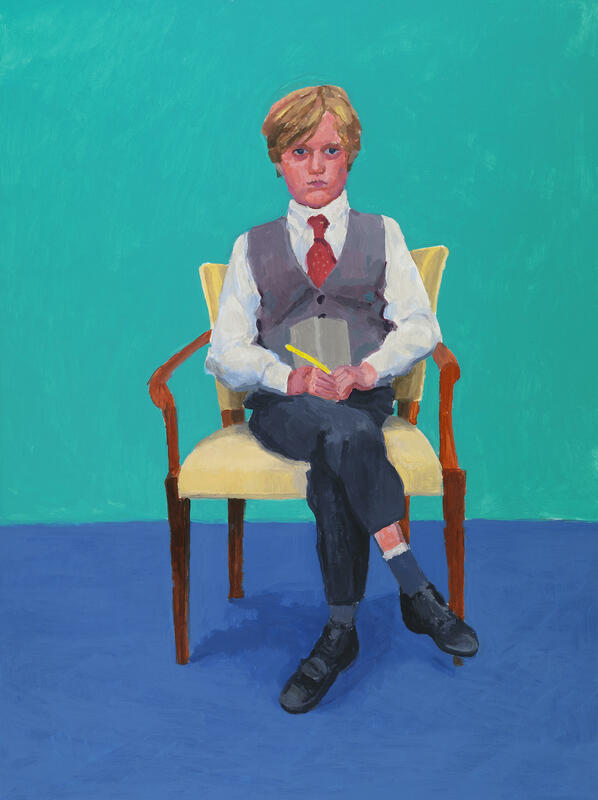 SUSAN STAMBERG, BYLINE: The youngest is Rufus Hale, 11 when Hockney painted him in 2015. His mother was making a film of the artist and took Rufus along. Rufus sat in a corner of Hockney's studio, sketching. Why don't I paint you, Hockney asked. RUFUS HALE: Right then and there, he just started. STAMBERG: Rufus was wearing a long-sleeve white shirt, nice pants, good shoes and a red tie that day. RUFUS: Yeah, I often wear suits and fancy clothes. STAMBERG: Do you have to do it for school? RUFUS: No, I don't. It's not a school thing. I just like to. It's the sort of thing I like to do. RUFUS: He gave me blue eyes for some reason. Aside from that, it was basically identical to me. It's weird (laughter). STAMBERG: I think blue-eyed David Hockney saw himself in the boy, a young, blond Brit sitting there with his sketchbook, just as young David would have done. Young, not so young - many ages populate these 3-foot-high squarish canvases. Curator Stephanie Barron says all kinds of sitters posed. STEPHANIE BARRON: It's a snapshot of David's life. You can have an eminent museum director or an architect or an actor next to the fellow who comes to wash his cars or some of the women who help run his household. There's a democracy. STAMBERG: They all sit in the same yellow armchair against the same blue or green background - Hockney's choice - on the same blue or green floor. On that floor, first, an assistant draws lines around their feet so they can reposition properly after breaks. Then Hockney charcoals a rough sketch on the blank canvas. BARRON: There is nothing except the canvas, the artist, his gaze and you. That's it. The rest of the world just fades away. DAGNY CORCORAN: He stands very erect. STAMBERG: Dagny Corcoran - friend and art bookseller. CORCORAN: He puts one hand behind his back like this, holds his arm out with a long brush, and it's like, whoa, that's amazing. That's what painters look like. STAMBERG: And they look and look, paint, look for three hours, then a break for lunch - excellent food, Rufus says - and then they work another few hours in the afternoon. By the end of day one, it's becoming a portrait. DOUGLAS ROBERTS: David has an uncanny way of capturing someone quite quickly. STAMBERG: Longtime friend Douglas Roberts, an art dealer, says Hockney starts with the head, then the body, goes back to the head and hands on day two, and finishes up on day three. ROBERTS: It's completely silent in the studio. He works absolutely quietly. And, you know, he's a bit deaf, you know, David. He's got hearing aids to assist. There was always music in the studio - opera playing or something - but now, not at all. STAMBERG: Silence, scrutiny, sitting. Curator Stephanie Barron thought she would go to work every day after she posed. BARRON: What I found instead is that I was so exhausted from the intensity of the scrutiny, I went home and took a nap. STAMBERG: But David Hockney kept going. In a way, he had to. ROBERTS: He had had a minor stroke, which sort of slapped him in the face a bit, I think. And the best therapy was to begin painting right away. STAMBERG: And he decided to paint friends - easy to gather and to be with. ROBERTS: He just needed the company to sort of get through. STAMBERG: At LACMA, where the portraits are hung in chronological order, Douglas Roberts can see his octogenarian friend's health improving from canvas to canvas. ROBERTS: He says when he stands at the easel and paints, he feels 30 years old. STAMBERG: That renewed health, the vigor resulted in 82 vivid, colorful portraits. Then there's the one still life. Instead of a person, there's a bright blue wooden bench with bananas, red pepper, lemons, oranges. Seems the friend scheduled to sit that day had to cancel. Her father was very ill. 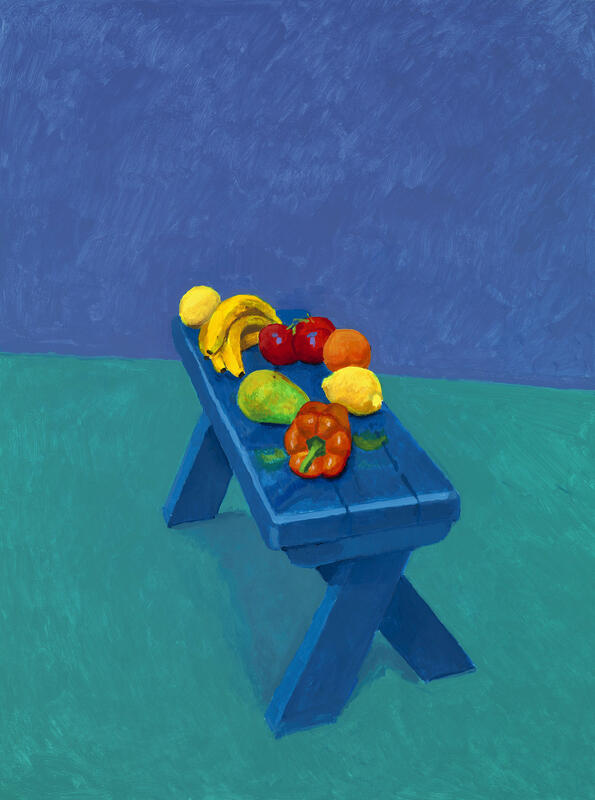 But the paints were all set up, so Hockney painted the veggies and fruit instead. What strikes me is how wonderful, when the sitter doesn't show for sad reasons, the joy he makes. BARRON: I think that's one of David's gifts. STAMBERG: One of so many gifts on view through the end of July at the Los Angeles County Museum of Art. Seeing it is like going to a lively party - David Hockney and his friends. I'm Susan Stamberg, NPR News, Los Angeles. Transcript provided by NPR, Copyright NPR.